The Bay Area will soon welcome the nation's first energy efficient ferry, powered by hydrogen fuel cells, a green technology that its inventor hopes will revolutionize the global maritime industry. 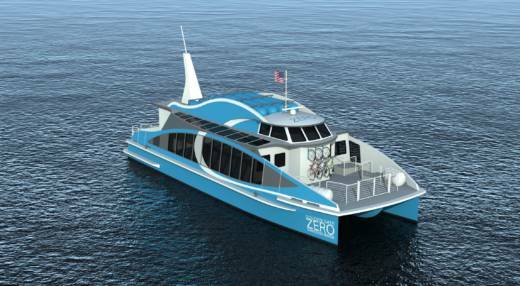 Alameda startup Golden Gate Zero Emission Marine announced on Monday that it had won a $3 million grant from the California Air Resources Board to help develop the “Water-Go-Round” passenger ferry. The prototype is the brainchild of Joseph Pratt, an engineer who has researched hydrogen fuel cell technology for 20 years. The catalyst for the Water-Go-Round was a study he led during his work at Sandia National Labs, where he helped develop fuel cell technology for use in cars, among other applications. The study, conducted in 2015 and 2016, looked at the feasibility of developing a high-speed ferry powered only by hydrogen fuel cells. "It was a real stretch from what had been previously done," he said in an email, "as we were both challenging the limits of the technology as well as exploring the feasibility in a much greater depth than ever before." Opportunity came knocking last year, when the California Air Resources Board announced it was accepting proposals for a zero-emissions ferry. "When I heard of the grant," Pratt wrote, "I knew it was the perfect opportunity to both prove the system works in the short term, while creating Golden Gate Zero Emission Marine in the process to enable long-term commercial adoption." The maritime industry remains heavily reliant on fossil fuels. Pratt's research has found that hydrogen fuel cells can power a wide range of vessels, from small fishing boats to the largest container ships. "The technology has the potential to completely eliminate emissions nearly everywhere we use combustion engines today," he said, "including the entire maritime fleet." On a global scale, shipping accounted for 2.8 percent of greenhouse gas emissions from 2007-2012, according to a study from the International Maritime Organization. In addition to being energy-efficient, the technology developed by Pratt requires little maintenance compared to combustion engines. "Fuel cells are fundamentally different than combustion engines in that they have very few moving parts, while an engine has hundreds, " he noted, "and they convert fuel directly to electricity without any mixing or burning." Moreover, for passengers, the ships make for a smooth, less smelly ride. The company is about halfway through the design phase and will begin construction of the ferry at an Alameda plant in late summer or early fall. Ultimately, Pratt says he wants to expand his work to include all kinds of diesel-powered ships. "The goal here is simple," Pratt wrote. "Eliminate air pollution to improve our health and get our world’s climate back on track."